In our increasingly technological world, many companies are taking it upon themselves to create, and craft to perfection, all kinds of different devices and systems to allow us better quality and easier convenience in the comfort of our homes. Being a lover of music for listening pleasure and paying close attention to audio cues in movies and TV shows alike, I firmly believe the quality of the speakers we hear audio through can make all the difference in the world. With the right speakers and sound systems, our music sounds brighter and allows us to appreciate notes we have never noticed before. High notes soar higher with crystal clarity, and we can feel low tones rumble our bones with the right bass-enhancing sub woofer. Gone are the days of low quality factory speakers muffling our televisions; we can finally have that ever-desired theater quality in our living rooms thanks to the efforts of brands like Vizio, who proclaims itself as one of the top user-trusted brands since 2014, and their incredible speakers and soundbars such as the Vizio SS2521-C6 sound stand. What is a sound stand? 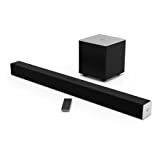 Plainly put, the sound stand works similarly to a sound bar in that one hooks it up and places it underneath their television for a higher quality sound experience. The Vizio SS2521-C6 is a wireless stand that measures 25" x 15.5" x 2" in with a weight of 11.24 lbs and is perfect for fitting underneath televisions of 55" or below. The SS2521-C6 manufacturers have specially designed for this sound stand with a wider range in mind that one can see in its clever design choice of a front-pointing chevron. Along with dual drivers in the front measuring 1.6" x 3.6" in and an internal subwoofer measuring 4.5" in for desired bass quality, this handsomely designed sound stand is an optimal choice for beginners and experienced audio device users alike. Consumers have placed it at #6 out of 70 on the Best Sound Bases list found across the internet. Customers show 65% above the average satisfaction sentiment with this product than with most sound bases. There are many exciting features packed into the Vizio SS2521-C6, and the manufacturing experts have carefully developed the correct ratios and measurements to optimize the highest quality professional sound at an affordable price. 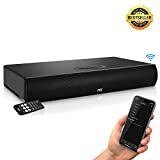 Some of these specifications include a 55-19,000Hz frequency response, total harmonic distortion at an impressive 1%, an output level of 101 dB, integrated audio amplifier, capabilities of both wireless and wired connectivity, bass and treble control options, besides the standard remote controlled volume, and high quality built-in decoders such as DTS TruSurround, DTS decoder, and Dolby Digital. The sound stand also features two different speaker channels available out of the box, one being the stereo and the other being the subwoofer. These drivers (full-range and subwoofer) have diameters of 3.6 mm and 4.5 mm respectively. One can purchase this product for around the price of $90 and will find the best deals and availability on Amazon. We picked three similar products available on the market to see how they compare: the ZVOX SoundBase 440 28, the Pyle PSBV600BT with Bluetooth, and the Bose Solo 5 TV Sound System. TruSurround gives one a virtual surround sound experience, TruVolume equalizes one's different audio content to avoid severe jumps in the level of volume. It also has two separate drivers (full-range and subwoofer) heighten the experience and give the user more options for variety in listening. AChevron design offers widened sound space that fills a room evenly despite its small, unintimidating size. However, this product also has its drawbacks. The LED light indicators on the side of the stand that display volume control, input selection, TruVolume, and TruSurround are not labeled and can confuse the user at first, making it difficult to accomplish much without first consulting the manual. Although the bass is admirable for its size, it can become overbearing at higher volumes and cause the desired clear quality to become muddled and inarticulate. 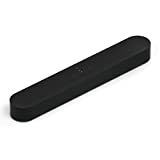 Lower notes and mid-range tones can become muddy and lack desired clarity and the bass is turned up to full capacity out of the box and can cause undesired vibrations that will disrupt the television or device hooked up to the sound stand. It is compatible with all televisions equal to and under 55 inches, computers, media players, and home theater systems. The length, width, and height are 23.8'' x 9.8'' x 4.7'' respectively and the bar puts out a maximum of 300 watts of power. The handsome wooden case painted with sleek piano-black finish paired with a blue back light LED display adds an aesthetically pleasing touch to any room it's placed in. This model has a built-in FM radio with a 30 station memory and two pair L/R audio jacks offer versatile listening. It is also built with a single-cable setup, no guesswork is necessary, and the interface of the front panel control center is user-friendly. The range of five speakers allows all volumes and pitches to have immense clarity while naturally equalizing to enhance the listening experience and the sound has low distortion tendencies even at higher volumes. On the other hand, unwanted vibrations can occur from the subwoofer at higher volumes and intense lower tones. Some users report the remote control functions can be finicky and that the sensor is incorrectly placed. 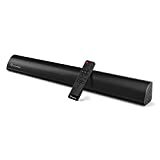 The FM radio function has issues with clarity from time to time; the quality can sound fuzzy and improperly tuned and many users have noted the soundbar does not have a long lifetime compared to others. The Bose Solo 5 TV Sound System is ranked #7 on a list of 70 of the Best Sound Bases found on the web. 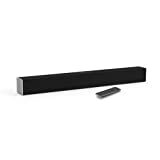 This simplistic, sleek, black sound system can be placed practically anywhere because of its smaller size. It can even mount on the wall! The unit is 3.38'' x 21.5'' x 2.75'' in and weighs 3.7 lbs. It features a dialog mode to make each word stand out with clarity and wireless Bluetooth capabilities for easy listening through your favorite mobile device. The universal remote it comes with offers the standard volume control and additional bass controls. Single cable setup makes getting started with this sound system a snap. Simple, versatile design matches with any television in any room with no bulky additional speakers. The wall mounting capabilities mean you can get creative with where you put it; the possibilities are endless! Dialog mode is excellent for clarity in any room to enhance the movie or TV watching experience. Easy setup with one cable and Bluetooth capabilities. However, one would mainly use this sound system for enhancement of factory speakers on televisions and computers. It contains no subwoofer, and its expertise does not lie in enhancing a music listening experience. One should not consider it a home theater experience as it does not feature surround sound or multiple internal speakers. The FM radio function has no visible display of volume level on the television screen. Overall, the lifetime is on the shorter side. It does not feature surround sound or multiple internal speakers. The Vizio SS2521-C6 Sound Stand is a formidable product for its price range. Although it seems underwhelming in its simplistic outside appearance, its chevron design and built-in high-quality decoders give it an impressive boost in the sound that will attract new and experienced consumers alike. 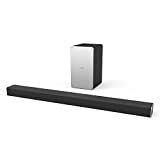 Because it is the cheapest audio enhancing device on the comparison list, it will not have such specs as multiple tweeters and subwoofers as the Pyle soundbar does, or output leveling systems like the Pyle and ZVOX do, it also has no FM radio capabilities to speak of. The overpowering bass can be this speaker's downfall at higher levels, and with louder listening, users note it cannot hold up like other speakers can. The sound stand also produces unwanted vibrations at higher bass volumes. At maximum wattage, the subwoofer causes the lower and mid-range notes to become muddled and lost due to lack of articulation and clarity. Besides these issues, the LED usage lights on the sound stand have also proven to be less than ideal. While the lights are helpful in theory, they do not label the LED displays that show volume control, input selection, and other functions. Understanding the LEDs becomes impossible without consulting the manual, and one can see this as an inconvenience. The setup itself also proves to be a meticulous process: they place the inputs at the backside of the sound stand and moving one's television to the side, or out of the way completely, becomes necessary during setup. If one has a television they cannot move for whatever reason, the only setup option is contorting their fingers awkwardly to wire the connections. Although it has a wide range due to its design shape, the sound stand needs to be at ear level for optimal listening. Standing or sitting above where the stand makes the sound easy to locate below the television. This means its horizontal coverage is stellar, but its floor to ceiling coverage is lacking. These critiques aside, the SS2521-C6 offers impressive overall quality for the cost. Vizio understands what consumers desire and does its best to deliver. The superior TruSurround and TruVolume decoders equalize sound volumes to avoid spikes in opposing audio files and offer impressive 3D surround sound. Despite its multiple speakers, it remains as one unit making it not too intimidating or bulky. The sound stand excels in making dialog crystal clear for enhanced television or movie watching. Overall, I give the Vizio SS2521-C6 a 3.5/5 star rating.